Sellers photo, updated photos to follow. None as of yet, the power supply cooked the first time I plugged it in. 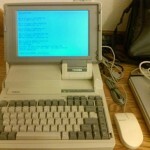 But I plan on MS-DOS 6.22 and Windows 3.1 once I have the power supply repaired and laptop booting. Oh no! Post some details of the repairs you make if you don’t mind, I’d be interested to know. Did this laptop have any sort of battery? Maybe not, considered that it had a hard drive. I will certainly post details and photos of repairs, from the smell of the failure it smells like blown capacitors, so I am HOPING all it needs is a recap of power supply and DC input board at worst. The laptop does have a battery, but I am sure its long since gone bad, there’s actually 2 hot-swap battery bays up front, pretty advanced for a 1980’s laptop. I assume the batteries are likely NiCd so MAY be rebuildable. Interesting… my recollection was that due to high power consumption, 80s laptops either had batteries or hard drives, not both. Anyway, great find! 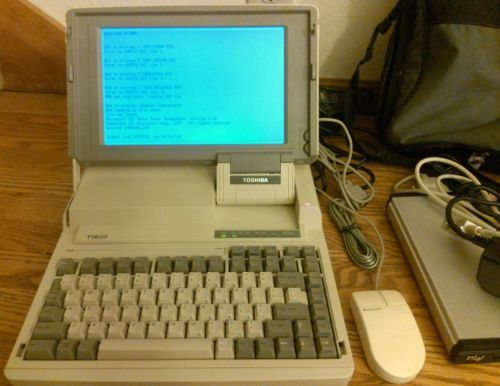 I’ve got one of these as well, no power supply no batteries, but has the modem/network card installed and needs the latch on the screen fixed and is in good clean condition otherwise. It’s going to go to a good home for free once I find someone to take it. I’m in Sydney Australia, so if you know anybody here who’d like it put them in touch with me. Wayne, I don’t personally know anyone in Australia, but I know of a gentleman named Terry (goes by Tezza) in New Zealand who is very much into vintage computers, you could get in contact with him via his webpage http://classic-computers.org.nz/collection/index.htm, that’s the closest collector that I know of, with it’s proximity to Australia I can’t imagine shipping being too bad. Barring that though, you could try listing it on some local sale site, you might find a more local taker too. Could have been one in the same, but who knows, they were common laptops in their day. I had one back in the mid 90’s combined with a Toshiba mobile printer, always thought they were neat machines. Are you able to tell me the power supply requirements? once i clean mine up i’d like to test it out but I do not wish to supply too much voltage and cause more damage. Thanks. It’s 12Volt, I do not recall amperage off hand, I want to say its 2.5amp, but that is less important, you won’t damage it with a higher amperage supply. Cleaning out I just found that my Dad has given me a looking time ago…..too fun!